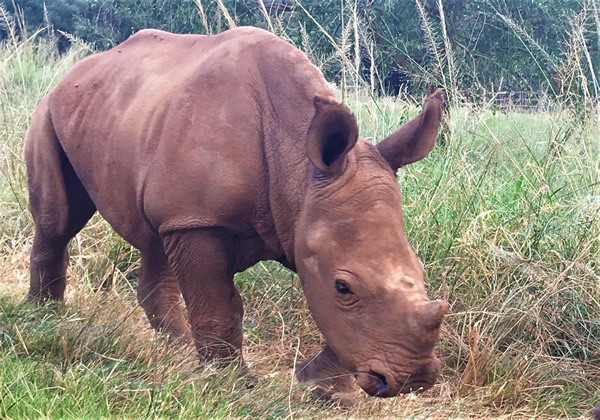 On the 22 December 2018, Care for Wild Rhino Sanctuary received a call about another orphaned calf from the Kruger National Park. The calf’s mother was reported to have been poached in the Kingfisherspruit area of the KNP. With lions nearby, it was critical to rescue this orphan quickly. Fortunately, KNP Head Veterinarian, Dr. Peter Buss, and his team responded quickly and airlifted the young calf out of danger. The 5 month old orphaned rhino arrived at Care for Wild Rhino Sanctuary at 11 am that morning, still in good condition. In fact she is a fat and healthy little rhino! After the tranquilizers wore off that afternoon, the little orphaned rhino woke up, keen for her first bottle of milk! In the Christmas spirit, the newest arrival at Care for Wild Rhino Sanctuary has been named Sparkle. With 16 liters of milk and many mouthfuls of grass, we are happy to say that Sparkle is definitely a little chubby unicorn! A week after arriving at Care for Wild Rhino Sanctuary, Sparkle met a part of her extended family. Summer has shown to be most fond of the new addition, with Arthur being quite pleased having another little sister. Sparkle has since joined the baby rhino crash and spends her time with Sophia and Kayla-Milan as well. We are happy to report that all the babies are enjoying their milk, mud baths and sunshine together. If anyone is interested in sponsoring this little orphaned calf, please send us an email to donate@careforwild.co.za for more information. She needs all the support she can get!